The March 18 flight test of a new RS-26 missile is part of a large-scale nuclear arms buildup by Russia and is raising concerns about treaty compliance, said U.S. officials familiar with details of the missile test. The RS-26 missile carried a dummy warhead from Russia’s Kapustin Yar missile facility, located about 80 miles south of Volgograd in southern Russia, to an impact range at Sary Shagan in Kazakhstan. The distance between the launch facility and the impact area is approximately 1,248 miles, far less than the threshold of 3,417 miles required by the 1987 Intermediate-range Nuclear Forces (INF) Treaty. It is at least the fifth time in the past five years the Russians have conducted flight tests of the RS-26 to ranges prohibited under the INF treaty. An Oct. 10, 2013 flight test also traveled less than 2,000 miles. Testing an intercontinental ballistic missile (ICBM) to intermediate range, as in the March 18 test, technically violates or circumvents the terms of the INF treaty, arms control analysts said. However, a State Department official said the RS-26 is legal under the 2010 New START arms accord and is not covered by the INF treaty. Technically, missiles are classified for treaty purposes as an ICBM or intermediate-range missile by the first flight test, and the RS-26 flew beyond the 3,417-mile INF threshold in its initial test. However, the multiple flight tests below that range have led U.S. intelligence agencies to report that Moscow covertly is developing INF missiles disguised as treaty-permitted ICBMs. A U.S. official involved in assessing treaty compliance said the latest missile flight test raises new questions about Moscow’s commitment to abiding by the terms of the 1987 accord. “It is a legitimate point to ask why the Russian Federation keeps testing this at intermediate ranges but gets to call it an ICBM and count it, when deployed, under the New START treaty,” the official said. The State Department last year accused Russia of violating the INF treaty by testing a new Iskander K nuclear-capable cruise missile banned under the treaty. But in its annual arms compliance report, the department did not address whether multiple flight tests of an ICBM to intermediate ranges also violates the INF treaty. Russia has denied the RS-26, also called the Yars M, is an INF missile, and has said the missile’s range is over 3,417 miles, making it an ICBM covered by New START. A Russian Defense Ministry official told Interfax on Thursday that the new missile, dubbed Rubezh, does not violate either New START or the INF treaty. “The Americans have not put forth any official complaints with regards to the RS-26 rocket because there is no reason for such complaints,” the official was quoted as saying. “The American side was informed of the telemetry of RS-26 test launches. It clearly proves that the new missile belongs to the class of intercontinental ballistic missiles and does not breach the New START Treaty and the INF Treaty,” he said. However, the National Air and Space Intelligence Center (NASIC) in 2013 categorized the RS-26 as a missile banned under the INF treaty that is being disguised as an ICBM. “The intelligence community believes it’s an intermediate-range missile that [the Russians] have classified as an ICBM because it would violate the INF treaty” if its true characteristics were known, a U.S. official familiar with the NASIC assessment told the Free Beacon at the time. The missile test was the latest element of nuclear saber rattling by Russia, which has been using its strategic nuclear forces in provocative activities. Moscow is engaged in a major nuclear forces buildup that includes new land-based missiles, new missile submarines, and new bombers. Adm. Cecil D. Haney earlier this month called recent Russian strategic forces activity increasingly provocative, and said that such actions were intended as political “signaling” to the West. “They are very provocative,” Haney said of Russian nuclear exercises during the Ukraine crisis, long-range nuclear bomber flights, and the violation of the 1987 Intermediate-range Nuclear Forces (INF) treaty through building a banned cruise missile. “Russia’s weapons-modernization plans will focus on strategic warfare and ways to mitigate what they think are our advantages, like prompt global strike,” Clapper said. The State Department official suggested treaty compliance questions about the RS-26 will be answered after it is deployed. Mark Schneider, a former Pentagon nuclear forces policymaker, said the new missile appears to violate the INF treaty and could also breach the terms of the New START treaty. The latest successful test launch and official Russian reports indicate that the missile is on track to be deployed this year or next, Schneider said. The Obama administration sidestepped addressing the RS-26 flight test to INF range in its arms compliance report last year, and Moscow has said the issue was not raised in talks with U.S. officials, he said. “We need a comprehensive look at the range of INF Treaty compliance issues that are now being reported in the Russia media,” he said. David S. Sullivan, a retired professional staff member of the Senate Foreign Relations Committee who specialized in arms treaty compliance, also said the RS-26 test appears to involve two treaty violations. “One involves cheating on the INF treaty range limitation, and the other of the New START—testing an SLBM [submarine-launched ballistic missile] in a land-based mode,” Sullivan said. “The Russians and the Soviets before them have a long history of arms control treaty violations beginning in the 1970s,” he added. State-controlled Russian press reports about the RS-26 launch stated that the missile is close to being deployed and is designed to defeat U.S. missile defenses. Russia’s opposition to U.S. missile defenses follows repeated official U.S. statements that current U.S. missile defenses are not designed to counter Moscow’s missile arsenal. Moscow is opposing European deployment of anti-missile interceptors and radar. Russia’s state-controlled Sputnik news agency said that the first test of the RS-26 in 2011 failed shortly after launch, but that subsequent flight tests in 2012, 2013, and 2015 were successful. The news agency said it is not known whether the latest missile test involved a single warhead or multiple, independently targetable reentry vehicles (MIRVs). 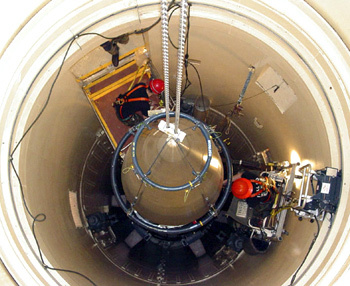 Both single warhead and MIRV variants were tested in 2013, the agency said. The new missile will be operational in 2016 and is more accurate than current ballistic missiles while capable of penetrating “even the most sophisticated missile defenses,” Sputnik said. Schneider, the former Pentagon official, currently working as a senior analyst at the National Institute for Public Policy, said a photo analysis of the new missile shows a uniform diameter the length of the missile, an indication it is not a modified SS-27 ICBM as the Russians have asserted. The SS-27 has stages of differing size diameters. Instead, Schneider said the RS-26 appears similar to the new submarine-launched Bulava-30 missile. A U.S. official said he disagreed with Schneider’s analysis of the RS-26 being a variant of the Bulava. The new missile raises several complex legal issues that should be addressed by the Obama administration, “but there is a possibility that the RS-26 is a New START violation as well as an INF violation,” Schneider said. Sen. John McCain (R., Ariz.), chairman of the Senate Armed Services Committee, said earlier this month he is concerned about the Russian nuclear weapons buildup. “Russia is developing a nuclear ground-launch cruise missile in violation of the 1987 INF Treaty, and the Russian military is pursuing modernization across the entire suite of nuclear systems,” McCain said at a March 19 committee hearing. “Russia likely is using its nuclear and cyber capabilities to intimidate and coerce NATO as part of its broader strategy to prevent the West from intervening in its invasion of the Ukraine,” he added. “We are confronted with Russia’s occupation of Crimea, continuing Russian aggression in eastern Ukraine, Russia’s increasingly aggressive nuclear posturing and threats, including the prospect of nuclear weapons in Crimea, and its violation of the Intermediate-Range Nuclear Forces (INF) Treaty,” said McKeon, principal deputy undersecretary of defense for policy. McKeon said in prepared testimony to the House Armed Services that despite the troubling nuclear activities “currently” there is no need to respond by expanding U.S. nuclear forces or the role of nuclear weapons in current U.S. strategy.